If you’ve been buying advent calendars since the advent of time, start a new holiday tradition by constructing one of these bespoke advent calendars this weekend. Every winter, children and adults from myriad cultures celebrate the Germanic tradition of the advent calendar—reveling in its myriad doors and pockets with eager anticipation of the surprises they will reveal on each of the 24 days before Christmas. But such a cherished symbol of the season can be personalized even more for the family or recipient by making it yourself with bargain materials. We’ve handpicked five homemade advent calendars that will give the gift of style again and again. 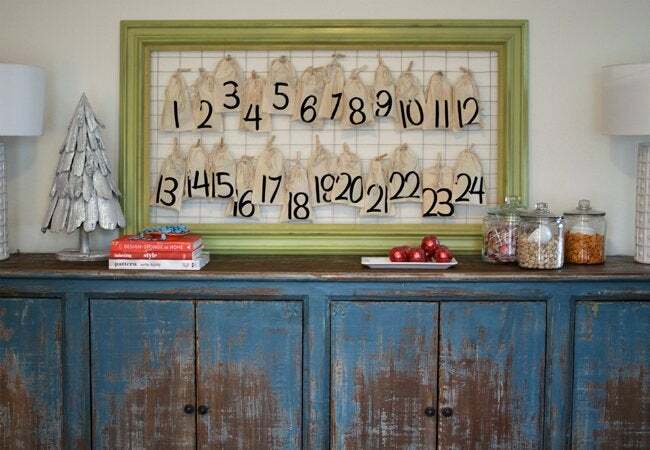 Come home for the holidays to this hospitable paper roll advent calendar! The thrifty blogger at Morning Creativity printed calendar dates on brown paper and glued the numerals onto 24 saved paper rolls. After filling each with unexpected treasures, she shaped the rows into a building-like structure and sealed them up with a cardboard backing. 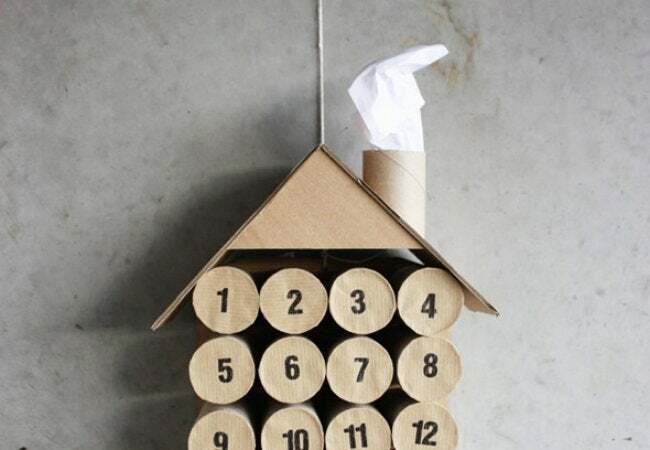 Half of a paper roll and a cut-up cardboard box create a fitting chimney and roof to house the season’s calendar. Perhaps the three little kittens in the famed nursery rhyme wouldn’t have lost their mittens if they had displayed them in this playful yet practical advent garland from the inspired DIYer at My House of Giggles. 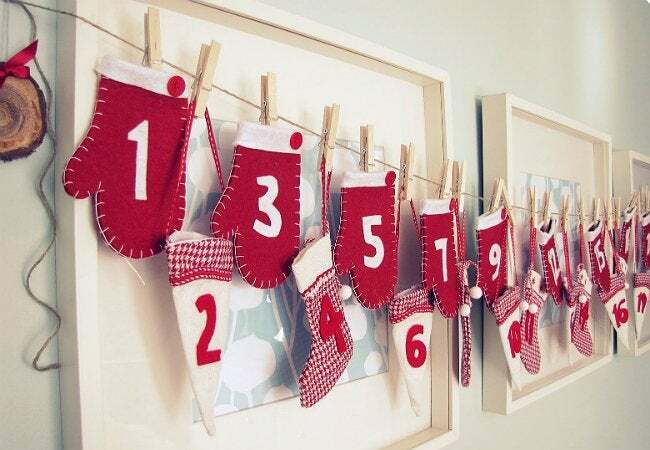 Create a similar festive finish to enjoy with your little ones by cutting out felt numerals freehand and hot-gluing them onto two dozen pairs of large mittens. 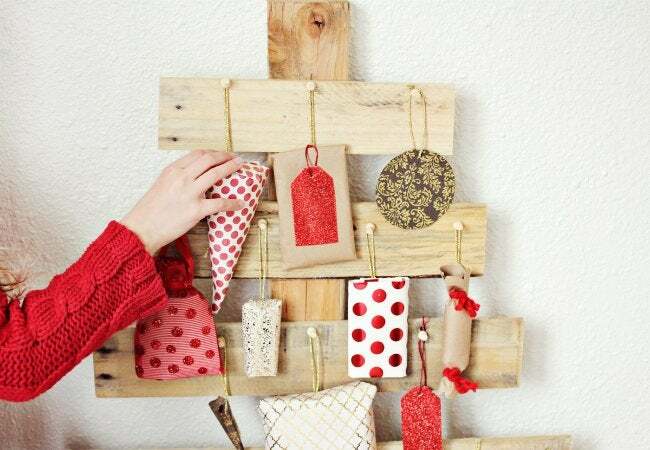 Hung up with clothespins and twine in any hallway, the festive mitten garland makes for a hand- and heart-warming holiday. Can’t wait until December 25 to get gifts under the tree? This DIY wooden advent tree from A Beautiful Mess solves that dilemma, with branches full of presents to be opened daily in December. While the upcycled evergreen requires a little more work upfront—some cutting, sanding, and sealing unused shipping pallets—the build is rather basic. “Branch” planks are arranged from largest at the bottom to the smallest at the top and nailed onto a spare pallet “trunk.” All that’s left is to hang a host of prizes, treats, and activity cards on each level! These fanciful, fabric advent pouches from the DIYer behind Brown-Eyed Fox are so photogenic that they’re worthy of framing—and so she did! After adhering iron-on numerals to muslin bags, the bags were filled with trinkets and treats galore and then drawn shut. Lastly, she arranged the bags in ascending order and pinned them to a brightly hued frame backed with cattle wire. Leaned against the wall, this cheery piece of holiday decor leaves no holes after the season ends. 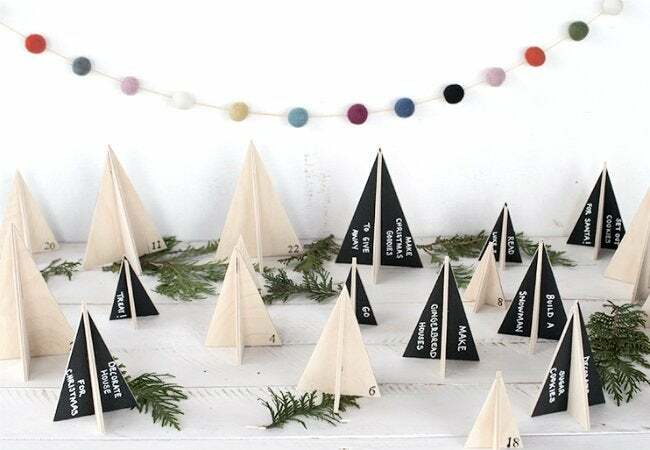 These advent tree table-toppers from The Merry Thought can turn any surface into a tree-lined route filled with surprises. Cut from birch plywood using tree templates and a scroll saw, assembly is super simple—just add a notch to the center of each triangle! Flat, the pieces are easy to store; interlocked them, though, and the geometric shapes transform instantly into a jolly jungle. Brush one side of each tree with chalkboard paint, as seen here, and you can change out unique advent activities for each calendar date year after year.